Historical evidence for the existence of Merlin and a Dark Age sea voyage to North America. In Merlin and the Discovery of Avalon in the New World Graham presents compelling evidence that the legend of Merlin was based on the life of an historical figure – the last Roman to rule the island of Britain. In the medieval Arthurian tales, Merlin was said to have been the guardian of the Holy Grail, a sacred cup that was kept in a secret castle. Stories relate how Merlin's descendants continued as guardians of the Grail until they became lost in the mists of time. In this real-life historical detective story, Graham not only identifies both an historical relic and a real castle behind these myths, he traces the descendants of the historical Merlin to a family still alive today – the Spencer family of Princess Diana. He also investigates the legend that Merlin possessed a secret Gospel said to have been written by Christ himself, and discovers a coded message left in an English country church that might reveal where this Gospel was secretly hidden. Ultimately, Graham examines the legend that Merlin sailed off to Avalon, a mystical land said to lie far across the western seas. In an eighth-century Irish manuscript, he finds evidence that this story was based on an historical sea crossing to North America a thousand years before the time of Columbus. 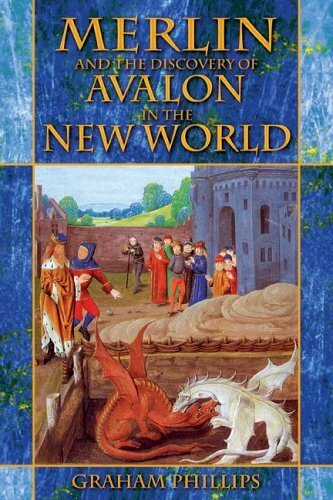 Merlin and the Discovery of Avalon in the New World is not only a fascinating historical investigation, it is an exciting adventure, involving cryptic code solving, secret societies, and a breath-taking race against time.